Capital spending on rail projects has been increased by £2.5 billion to ensure major Network Rail projects are continued. There will be a claw-back of £1.8 billion in assets sales that are deemed not to be a core part of network operations including property and greater income from the use of the digital telecoms network by third parties. The decision was announced as part of the UK Government Autumn Statement which sets out spending plans over a 5-year horizon. In terms of capital spending the Department for Transport has secured a significant increase in funding but its resource budget which reflects the running cost of the Department and revenue account spending will be reduced by 37% over the period. This is in part possible because the continuing growth in rail passenger numbers exceeds expectations. 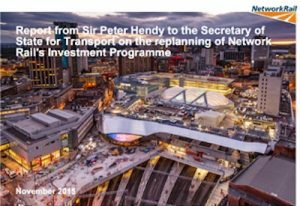 The latest data suggests that there will be annual growth of 4.7% which is someway in excess of the 2.5% forecast in the Network Rail planning process. Increased numbers are not the result of discounted prices as 5% annual revenue growth has been recorded. As a result franchise premium payments will be higher than previously forecast and where revenue support payments are required for regional services these will also be offset by higher passenger numbers although costs will increase as new higher quality rolling stock is provided. It has also been agreed that system running costs represented by spending on operations, maintenance and renewals cannot be reduced in line with the original regulatory settlement for CP5 as the savings would impact on day to day performance and safety although some track renewals will be deferred until the next control period. The Government has accepted in full the result of reviews by the newly appointed Chairman of Network Rail Sir Peter Hendy into the revised cost of required outputs in Control Period 5 and organisational changes proposed by leading financial and regulatory expert Dame Collete Bowe. NR has advised the Government that no projects within the original upgrade plan will be cancelled but not all will be completed by 2019. Among work deferred is electrification beyond Cardiff to Swansea but the funding promised to the Welsh Government for electrification of the Cardiff Valleys network will be maintained with work starting in 2017. Route re-opening and electrification of the East – West line between Oxford and Bletchley will also be deferred until after 2019. The Bowe review concentrated on the reasons for the gap between the Statement of Funds Available (SoFA) provided to the Office of Rail and Road and what it was believed could be delivered in the form of the High Level Output Statement (HLOS). 80% of the cost over-run is due to electrification schemes where a shortfall of expertise given the lack of such previous projects and an under estimate of obligations under the planning regulations are major causes of increased spending. FCP continues to advise clients on a range of infrastructure / service improvement initiatives and is well placed to provide advice on project planning and funding.